The Offenbach Fair may be reached very easily and comfortably via the motorway, rail and express train and also over the international airport Frankfurt close by. Car parks for exhibitors and visitors are close and in walking distance by the Main bank and the harbour area. The hall grounds are situated within the City of Offenbach – right in the middle of all activities of the lively urban surroundings of Offenbach and Frankfurt. Plan with Google Maps your way to the Kart Exhibtion in Offenbach am Main. Autobahn A5 to Frankfurter Kreuz, then A3 direction Würzburg/Offenbacher Kreuz and the A661 direction Bad Homburg until exit Offenbach-Kaiserlei. at the roundabout take the exit Messe/Hafen and follow the signs to the fair center (Messe). Please use the indicated car parks ‘Mainufer’ or ‘Hafen’. Alternatively: Ar rhe roundabout take the exit Offenbach-Zentrum (Berliner Straße), follow the street about 2 km, at the crossing turn left into Kaiserstraße and follow the signs to the parking lots (‘Mainufer’ or ‘Hafen’). Autobahn A3 to Frankfurter Kreuz, then the A661 direction Würzburg/Offenbacher Kreuz and the A661 direction Bad Homburg until exit Offenbach-Kaiserlei. Further route as described above. Autobahn A5 to Frankfurter Kreuz, then the A3 direction Würzburg/Offenbacher Kreuz and the A661 direction Bad Homburg until exit Offenbach-Kaiserlei. Autobahn A5 to Bad Homburger Kreuz, then the A661 direction Egelsbach up to exit Offenbach-Kaiserlei. Autobahn A3 direction Würzburg/Offenbacher Kreuz, then the A661 direction Bad Homburg until exit Offenbach-Kaiserlei. Visitors travelling by rail can reach the Offenbach Faircenter from Frankfurt-Main Station directly by express rail with line S1 – direction Ober-Roden, line S2 – direction Dietzenbach, line S8 and S9 – both direction Hanau. 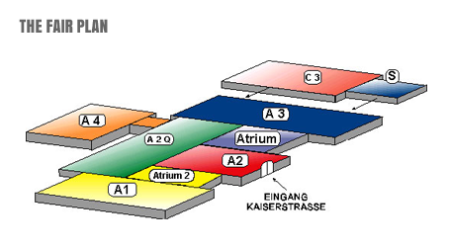 We recommend to take a ticket up to station “Offenbach-Marktplatz” and then leave the platform via exit “Herrnstraße”. There are only a couple of minutes walking distance to the Fair grounds on Kaiserstraße. Further information train connections: www.bahn.de. Your destination is Frankfurt International Airport. Arrived there you may take the S8 or S9 (both direction Hanau) at the airport directly to Messe Offenbach (about 20 minutes to drive). More information concerning connections from Frankfurt airport: www.frankfurt-airport.de. Visitors who use the public transport net of Rhine-Main (RMV) have the possibility to reach the Fair directly by express rail (lines S1, S8, and S9, direction Offenbach Ost or Hanau). We recommend to take a ticket up to station “Offenbach-Marktplatz” and then leave the platform via exit “Herrnstraße”. There are only a couple of minutes walking distance to the Fair grounds on Kaiserstraße. More information to public transport connections: www.rmv.de.